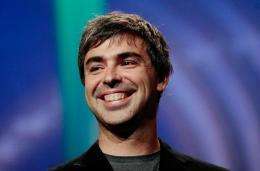 Google co-founder Larry Page, pictured in 2007, who took over as chief executive in April, is refocusing the Internet giant on products and its "start-up philosophy," its chief financial officer said Wednesday. Google co-founder Larry Page, who took over as chief executive in April, is refocusing the Internet giant on products and its "start-up philosophy," its chief financial officer said Wednesday. Patrick Pichette, speaking at the Fortune Brainstorm Tech conference in this Colorado ski resort, also said investors should not worry about Google earning revenue from its Android mobile operating system or its Chrome Web browser. "With scale there always becomes this tension of how do you keep the start-up philosophy," Pichette said of the Mountain View, California-based company which now employs over 28,000 people around the world. "We don't want to lose our start-up philosophy," he said. "Through the reorg(anization), the realignment that Larry did a couple months ago, he just wanted to put focus specifically on product," Pichette said. He said the key message Page is trying to get across is that Google is a "very young company, we are in start-up mode (and) we are going to invest for the long term." Page, who founded Google with Sergey Brin in 1998, replaced Eric Schmidt as CEO during the first week of April, ending a "triumvirate" management structure that Pichette said was "slowing us down." Pichette said Google's Chrome Web browser has attracted 160 million users and 550,000 Android-powered mobile devices are being activated every day. "When we have products that get resounding user and consumer success and that are growing in the hundreds of millions we don't worry," he said. "The only question is when and how will we monetize. "Everybody's all nervous about the fact it's been 36 months since Android has launched and you only have search (revenue)," he said. "That's the criticism I hear. "The questions that are asked are so short-termish. That's just not the way that Google thinks," he said. Google earns revenue from searches done on Android devices but it "fuels so many other avenues of growth," he said, citing Google Wallet, Google Payments, Google Offers and other products. Pichette also said that Google was having no trouble attracting high-quality engineering talent and its attrition rate over the first half of this year was its lowest ever. "We took a strategic decision at the end of last year which was to raise everybody's salary by 10 percent," Pichette said. "Part of the strategic decision we made there was we wanted to send a signal to the market that... Google will continue to be the place of choice, and we wanted to signal that very clearly to our employees," he said. Pichette said 600,000 people applied for jobs at Google in first three months of the year alone. Responding to a questioner in the audience who suggested Google is not paying its fair share of federal taxes, Pichette said the company pays "all our taxes in every jurisdiction to the full extent that the law allows us. "We pay every penny of tax we owe to everybody everywhere," he said. "I don't make the laws. I'm just like every other corporation." Google's effective tax rate in the second quarter of this year was 19 percent, according to its latest earnings report.